Reading the press announcement for Nest Cocoa Woods, I had one of those "time flies" moments. 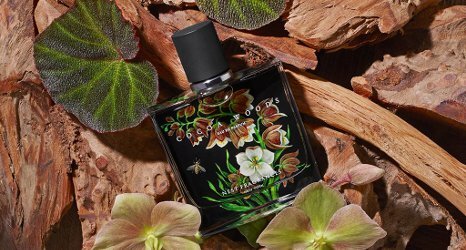 Cocoa Woods has been released to coincide with founder Laura Slatkin's 25 year-anniversary in the fragrance industry and the 10-year anniversary of the Nest fragrance line. Yes indeed: Slatkin and her husband Harry launched Slatkin & Co. home fragrances in the early 90s, and Nest's candles and other home and body items made their debut in 2008. I just can't believe it's been that long! Nest's "fine fragrance" collection started up in 2012 and currently includes twelve scents, by my count. Cocoa Woods, the newest addition, is described as a "woody-gourmand scent" with notes of cocoa, sequoia wood, white sandalwood, tiaré blossom and ginger. Like the rest of the line, it has a beautiful bottle with decoration inspired by eighteenth-century floral illustration and découpage. And it's really the packaging that keeps me coming back to this line, because I'm still looking for a Nest fragrance to love. Would Cocoa Woods be "the one"? I tried it out in Sephora, and on the blotter it seemed completely charming, a sophisticated comfort scent of powdery chocolate and creamy-smooth sandalwood. I was briefly tempted to impulse-buy a rollerball, but I resisted (small victories!) and instead requested a sample to take home. My experience of Cocoa Woods on skin was different, and weirdly unpredictable. One day, it was such a blunt assault of synthetic woods that I had to fight the urge to scrub it off. It seemed strangely masculine for a relatively mainstream fragrance line aimed at female consumers, and I started thinking that it had to be a cynical mash-up of Angel's gourmand heritage and Le Labo Santal 33's woody hipster cool. Maybe I was just especially hot and cranky that day, because I didn't dislike Cocoa Woods quite so much the second time around. It still felt harsh for the first hour or so — the chocolate note seemed overly bitter, and there was something ozonic in the initial application that stings my nose. After a while, though, the cocoa settled down against its woody background. I think I detected the white floral note here and there — it felt oddly beach-y against the cocoa — and the dry down turned musky as well as woody. Despite its claim to be "empowering" and "fearless," however, Cocoa Woods just ended up smelling too thin and flat for me. Despite its beautifully designed and executed bottle, it felt like a slightly elevated Bath & Body Works fragrance blend. Of course, I realize that I'm not the target audience here; the reviews on the Sephora positive website have been mostly positive so far, with praise from customers who are tired of mainstream floral perfumes. I can see how Cocoa Woods might feel like something new and different to shoppers who are tired of Marc Jacobs flankers and their pink-tinted ilk, and I hope they'll continue exploring. As for me, I still love Nest's Blue Garden candle, and I'll continue to gift friends and family with the brand's candles, hand washes and lotions (please bring back the Orange Blossom collection, Nest!). But for now, at least, my "perfume cabinet" will remain Nest-less. 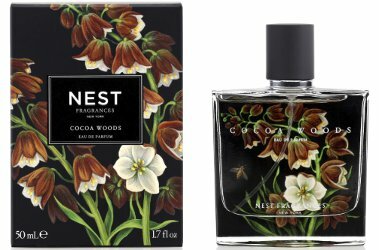 Nest Fragrances Cocoa Woods is available in 50 ml Eau de Parfum ($72) or 8 ml rollerball ($27). I agree though…I’ve never found a Nest that I love. I have Scentbird vials of Indigo and Midnight Fleur, but just don’t reach for ’em…. I was really hopeful for Wisteria because I love actual wisteria…but nope. Oh well. I’ve sampled these from time and time but have never been tempted to buy any. Personally, I think Nest produces more interesting scents for the Calvin Klein Home candle collection (Nest has held the license for quite a while). I wonder why that is. Interesting! Different results for different briefs/clients, I suppose. I do like some of the Nest candles very much, but haven’t tried CK’s candles. The CK candles can be had on the cheap at TJ Maxx/Home Goods/Marshalls! I completely agree! The visuals for this collection are perfect. I also keep hoping to love them because of the bottles! I have several of their scents in 10 mL rollerballs, and as I find them all perfectly acceptable (slightly elevated B&BW, as you say ), that’s just the right amount for me. They’re pleasant office scents! I have a co-worker who wears Black Tulip to the office and she smells good, in a subtle and office-appropriate way! Never found a Nest fragrance that I had to have, but I’ve always said that I’d happily buy prints of their packaging illustrations. I bet you could print and frame some images of the works that inspired them! There’s a thought! Thanks for the link. I had a similar experience with this. I would have liked it more if the cocoa lasted longer. I plan on retrying it come fall. It definitely feels like more of an autumn fragrance than a summer fragrance. I wonder what motivated this summer release date. The Nest bottles are so beautiful! Alas I too have not found one that I loved (I remember LIKING one that I think was based on peony… but that sort of scent is not a hard sell for me). ah! Well, they *are* display-worthy bottles! That must have looked sweet. I usually can’t remember much about these fragrances after I’ve tried them. This one made a stronger impression, just not a great impression. I wanted to get a sample of this today at Sephora and I was told they have a new policy for giving out samples You now have to give your Beauty Insider information with each sample you are given.Has anyone else heard this? No, and I just picked up samples last Friday. They took my info at the entrance when I picked up a free sheet mask a couple of weeks ago. I didn’t have that experience last week at a NYC Sephora…but who knows?! Interesting. Thanks for the review, Jessica! I got the mini rollerball with my Sephora points rewards, tried it yesterday (hot, humid weather), and it sounds like my experience was similar. It seemed synthetic and overpowering for an hour, then…flat. So I’m looking forward to giving it a try in winter. There are some synthetic bases I just enjoy more in the cooler weather, when the heat isn’t making it all jump up at once. I did think it would make a nice candle. I really wanted to love it so I’m glad I’m not alone. You’re right: it would make an excellent candle!! Has anyone here tried Yves Rocher Neonatura Cocoon? It sounds a little like that. It all just reminds me that Id really like a black floral duvet cover. Ooh, I remember having a sample of that, ages ago! YR does nice work for the price. I have so many black-floral motifs in my wardrobe and accessories…maybe that’s why I keep hoping to love a Nest perfume! I have a lot of black florals in my closet as well. Have you ever looked at the caftans/robes made by Natori? So fantastic! I buy them discounted at Nordstrom Rack (online.) My fam would say that’s my signature lounge wear look. On the same page as everyone here. Never found one that I had to have. All of their bottles are gorgeous though!